Lighting is a technology that we all take for granted each and every day. It provides the best working conditions possible for our specific environment. The operating room is a work environment that needs just the right amount of light. The question then arises, what is that right amount of light for an operating room? 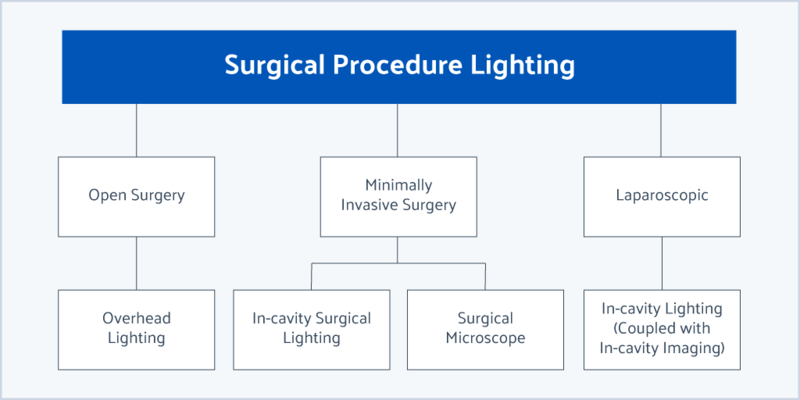 The primary function of surgical lighting is to illuminate the operative site on and/or within a patient for ideal visualization by OR staff during a surgical procedure. With proper lighting, operating room staff can achieve a higher level of efficacy during surgery and reduce the risk of complications. 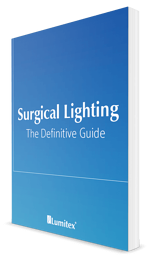 However, there are several different factors to consider when choosing surgical lighting. Many surgeons require flexible lighting that can meet their high demands, while also minimizing shadows and generating the least amount of heat as possible. In the next section, we will take a look at common lighting available to meet the needs of operating rooms today. We will define each and analyze its advantages or disadvantages. Overhead lights are usually either LED or incandescent. The lighting fixture can be mounted on a ceiling or wall and have handles that allow the surgeon to adjust the lighting as they see fit. It is also adjustable to help prevent glare. One challenge with overhead lighting is the possibility of not precisely illuminating the operating room. These types of light allow for something called the “brute force approach,” which floods the operative site with large amounts of light. It can create a diffused light pattern with strategic lenses. If you are considering new OR lights, you need to assess factors such as shadow reduction and heat generation. Headlamps can offer brightness, dependability and comfort for surgeons. The lights are wearable and allow light to follow the attention of the surgeon. Headlamps help create mobility for the surgeon and shadow -free illumination. They can be battery-powered or connected to a standalone light source with a fiber optic cable. They offer brilliant clarity and ease-of-use. Surgical loupes are small magnifying devices that are typically attached to the lenses or frames of glasses. Often these surgical loupes feature a small lamp attached to the center of the frame to illuminate the operative site. Illuminated surgical loupes are critical in some cases because they enhance and magnify an area during surgeries requiring a high level of dexterity when working with small structures. When surgeons use magnifying loupes under intensive surgical shadowless lamps for a better view of the surgical field, the total luminance is about 200 times brighter than that of typical office lighting. In-cavity lighting allows for lighting deep inside surgical cavities. If current overhead and headlamp lighting are not adequate, in-cavity lighting is a viable option. With this type of light, the light source is typically outside of the sterile field, meaning it can be a fixed light on its own or connected to a surgical retractor or instrument. In-cavity lighting can be customized to specific needs and levels of illumination within a surgical corridor. If surgery is taking place within a deep, minimally invasive corridor, in-cavity lighting can be used with fiber optics to eliminate factors such as added heat. The construction of a fiber optic medium allows light to be transmitted over long distances with minimal distortion. We counteract this process by using proprietary processing techniques to cause the fiber optics to emit light in a controlled manner. This allows surgeons to visualize deep within cavities. 1. Fiber optics allows high-intensity light to be conveyed to the operative site while maintaining heat and EMI generating electrical equipment at a distance from the patient and other medical equipment. 2. Fiber optical surgical illuminators are inert devices, presenting no risk of electrical conduction to your patient or operating room staff. The materials used in fiber optics have varying characteristics and applications. Below we discuss polymer versus glass optical fiber. Polymer optical fiber allows for lower cost surgical light that can easily be created through manufacturing and material processing. It is a safer, cooler approach to surgical lighting due to the spectral response of the polymer fiber - it acts as a natural filter to infrared light transmission. Glass optical fiber provides a higher degree of optical transmission when compared to polymer optical fibers. The only draw-back using glass over polymer is the cost. Glass optical fiber is typically more expensive to produce than polymer fiber. Glass optical fibers transmit the full spectrum of light including the wavelengths that transmit heat. This is sometimes not ideal when working deep inside a cavity. The type of surgery being performed tends to dictate the surgical lighting needed. Traditional open surgery can employ overhead lighting when the operative site is not deep within the patient. Minimally invasive applications may require in-cavity surgical lighting or a surgical microscope with integrated lighting. The minimally invasive approach provides an advantage that allows surgeons to create smaller incisions. The less invasive approach, where the surgeon is operating in narrower and deeper cavities, requires better visualization and illumination. Laparoscopic surgery is a type of surgery that also uses smaller incisions and is minimally invasive. The process garners its name from the laparoscope, a tool that has a tiny video camera and light on the end. It involves less cutting and less internal scarring. This procedure uses in-cavity lighting coupled with in-cavity imaging. Intermediate cables are typically used to transmit light from a light source to an illumination device and may have a specific termination to adapt to a light source or instrument. Like optical fibers, there are different optical fiber cables. As surgeries and surgical systems continue to advance, we evolve our lighting technologies to adapt to these changes. Our Single Cable System (SCS), eliminates the intermediate cable while extending the length in one disposable light. SCS is designed to illuminate the cavity with bright and shadowless light. Unlike the re-sterilizable optical cables, SCS requires no sterilization. So there is no sterilization cost associated and because it eliminates the need for the re-sterilization cable, the risk of infection by contamination is non-existent. Bright light is key to having the best illumination. High-quality light sources are essential for this to happen. Light source types can include LED, Xenon, halogen and incandescent lamps. We will cover the first two types: LED and Xenon. LEDs offer quality, performance and durability. They offer advantages over conventional lamps due to their high energy efficiency. LEDs typically have an estimated life (on the order of tens of thousands of hours of run-time), and there is less heat generation at the light source. This type of light source is offered in tabletop units and wearable light sources. According to Cogentix Medical, "Pure white Xenon surpasses the optical intensity offered by traditional halogen light sources, providing sharper contrast and excellent color balance for improved tissue differentiation." The light source is also offered in tabletop units. It has lower run times (on the order of a thousand hours) but has the highest light output, which also means it has the greatest heat generation within the light source. 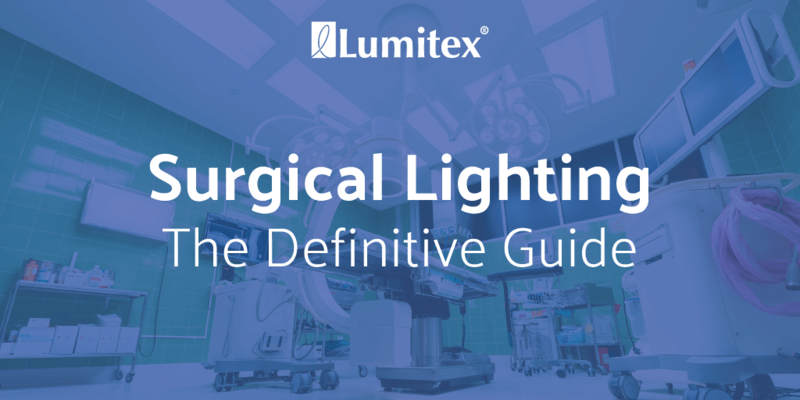 High-quality surgical lighting is essential for every operating room. Based on a survey conducted at the National Association of Spinal Surgeons, 94% of surgeons agree that lighting in the cavity could improve surgery and reduce risk and 100% of surgeons believe there is always room for improvement. At Lumitex, advances in lighting will continue as technology and alternative options evolve. Our new design technology, Single Cable System (SCS) is one of the new advances. We always strive to concentrate on the quality of light and reflect that concentration through our technology. 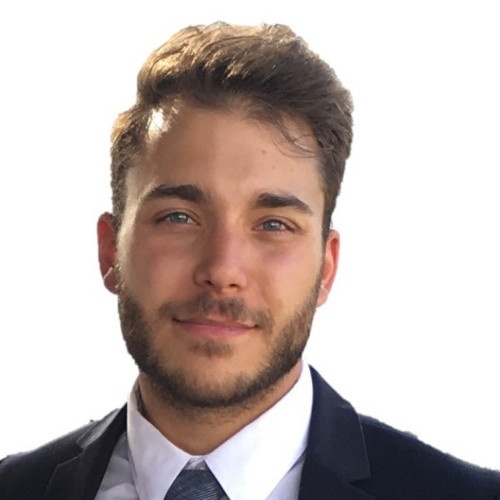 Brandon Shafer-Zatko is a Design Engineer at Lumitex. He manages the design and development of surgical lighting products from ideation, through design controls to release.